Italian watch company U-Boat has announced the release of two new models of watches U-42 GMT and “B and B”, the world premiere at the upcoming Baselworld 2012 watch show. All brand for the seventh time taking part in this prestigious event for the watch industry. To create the design of both models is the master of inspiration to watch U-42, specifically released in 1942 for the Italian Navy. The round body of the model with a massive 53 mm in diameter, the rear cover and bezel are made of titanium. Black dial and clock hands made of brass. The front side of the body is equipped with a sapphire crystal. The case provides a 300-meter water resistance. In the watch case U-42 GMT has an automatic modified and personalized specifically for U-Boat mechanism with date display and crown at 9 o’clock position. Cruising the caliber of 48 hours. Watch U-42 GMT are an excellent example of a timing function indicating hours, minutes and seconds by means of the central arrow, 3 time zones and dates. The watch comes on a leather strap brown with a titanium buckle. Release of new items is limited – only 300 copies. 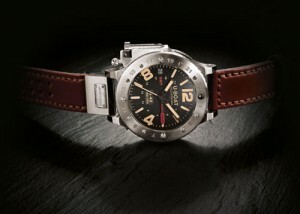 Echoing the company’s new “B and B” is the owner of a large titanium case with IP-coated black and a diameter of 53 mm. Bi-dial model is made of brass, bronze and black. The front part of the body is protected by sapphire crystal. Water-resistant watch up to 300 meters. Life is a novelty “breathes” a modified mechanism for automatic height 4.60 mm and the carrying frequency of 28,800 vibrations per hour. Cruising caliber 40 hours. Calibre 25 is assembled on the rocks. Options – Display hours, minutes, seconds. The back cover is screwed into the casing 6 hexagonal screws for maximum protection. The rotating bezel bi-directional, equipped with a locking system with a lever on the right side is adjusted clockwise layout, where the hour markers are made of ceramics in the form of small balls. Watch “B and B” are delivered to the hand-sewn strap in genuine calfskin brown buckle fitted with a titanium or bronze. Strap attached to the body with screws. New released in a limited number of 300 copies. Buy a watch will be the official representatives of the company U-Boat.